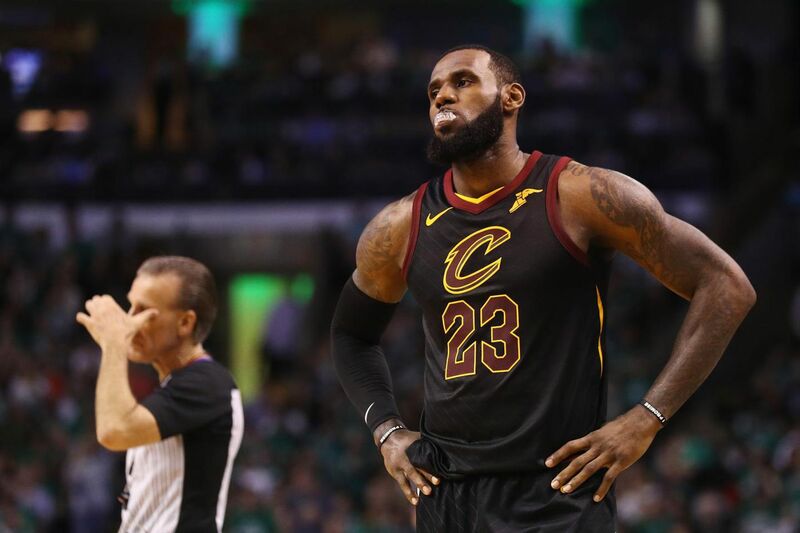 LeBron James’ season might very well end on Sunday night in Boston, the same as his second career with the Cavaliers might end. The Celtics haven’t lost at home in the 2018 playoffs and very well might not on Sunday night. They could win Game 7 and prevent James from making it to eight consecutive NBA Finals. And you have to know that eight straight would be an achievement for James that would stand with any the NBA has ever seen in the postseason, and that includes Bill Russell’s Celtics winning 11 championships in 13 years in another pro basketball world, and Michael Jordan going 6-0 in the Finals in the 90s, even if Michael’s Bulls never faced an opponent close to the Warriors team James has already gone up against in the last three NBA Finals. But whatever happens in Boston, and in the ’18 Finals if LeBron James does make it that far again, he has hopefully taken a sledgehammer to the mythology about greatness in professional sports only being defined by number of championships won. Now he has to try to beat the Celtics without Kevin Love, the Cavs’ second-best player, who is out of Game 7 because of concussion symptoms. The only reason the sides still seem even is because of No. 23. Do titles matter in evaluating the legends and immortals in sports? Absolutely they do. Are they the only marker? The notion that they are is ridiculous. Willie Mays’ teams won one World Series and he is considered the best all-around player who ever lived. Hank Aaron won one. Jerry West won one. Dan Marino, one of the best quarterbacks who ever lived, won none. LeBron James is the best all-around basketball player who ever lived, and has reminded us of that over the last six weeks or so, as he has scored 40 points in seven of his 17 playoff games and made a couple of the most memorable shots of his extraordinary career – the step-back buzzer beater against the Pacers in Game 4, that going-to-his-left H-O-R-S-E shot to beat the Raptors – along the way. If his season does end on Sunday night, as it sure could, the NBA is diminished, and gets less interesting. Whether you love LeBron or are among the Flat Earth Society people who still hate him and refuse to give him his due, you have to understand that. We hear constantly that Kevin Durant or James Harden or somebody is the second-best player in the game. And you know what? One of them is. Harden will likely win the MVP this year. But neither of them is close to LeBron James, even though this is clearly the year when voters will decide it’s somebody else’s turn to win an MVP. It used to happen this way when Michael was MVP, every single year. This is a time when there is almost as much young talent in pro basketball as there is in baseball. But the sport does become less compelling and less fun when James isn’t in the game you are watching. Nothing against the Celtics, who have been the surprise of these playoffs without the guys who were supposed to be their two best players this season – Gordon Hayward, Kyrie Irving – and will likely be the favorites to win it all next season, no matter how this one ends. The Celtics have the best coach on the planet in Brad Stevens, and a team that their fans have embraced as much as any Celtics team ever as they’ve made their own run at the Finals. I would love to see these Boston kids in an NBA Finals. I just would rather see LeBron in one more, maybe for the road. For most of this current run, Love was Cleveland’s primary secondary scorer. But only a handful of times did Love, who’s also the team’s primary rebounder, score 20 or more points. Love only played five minutes Friday night after his collision with Jayson Tatum. You still saw what LeBron James did without him. You saw how he played. Durant doesn’t do that, Harden doesn’t, Steph Curry doesn’t. No one else does. This is sports being elevated to the highest possible place, no matter what happens tonight; even if Atlas shrugs in one more Game 7. Kyle Korver said once again after Friday night’s performance from LeBron James that “I’m just glad he’s on my team.” Always, comments like that make you remember something Brian Leetch said to me a long time ago, at the Rangers’ practice facility. I asked Leetch what it was like to be a hockey kid, one who grew up into being a great player himself, and finally get to play with Wayne Gretzky. Leetch smiled and said it was more than just getting to play with The Great One. “I’m just glad I lived in the same time as he did,” Leetch said. Tom Brady is the G.O.A.T in pro football. But as brilliant as he is, even at 40, and even though he has won more titles than James has, as much as he has done in the fourth quarters of memorable Super Bowl games, it is still not the same watching him throw a football as it is watching James play basketball the way he is playing it right now. We come to sports for a lot of reasons, mostly asking sports to be the memory-making business for us all. But we come for genius and magic, too; to see great athletes make the impossible seem possible. 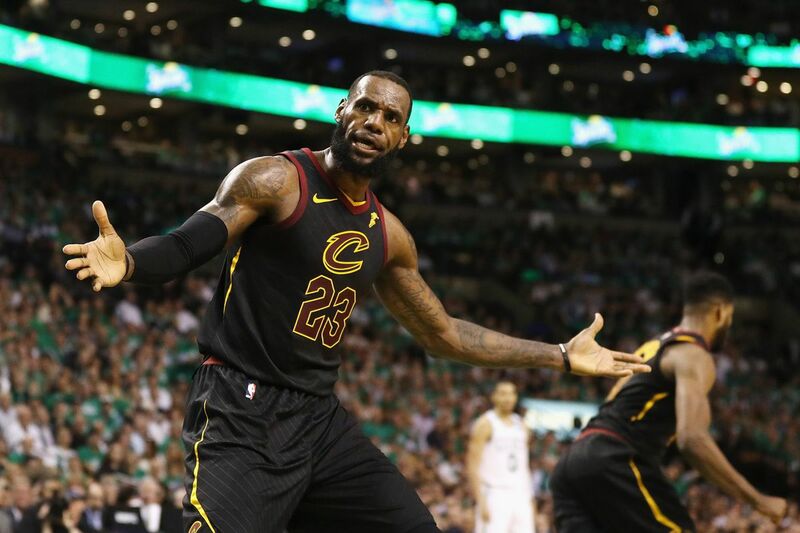 So far in these playoffs, with Love and Korver and George Hill and Tristan Thompson and old friend J.R. Smith, not only has James made the impossible seem possible, he has made it predictable. He has made us come to expect it. So he gets one more game against the Celtics on Sunday night, on the road, with perhaps the thinnest team around him since he first took the Cavs to the Finals over a decade ago; without Kevin Love now. LeBron still has a chance at one more trip to the NBA Finals with the Cleveland Cavaliers. One more time in an extraordinary 15-year career, he is the main event. Might be the last game of his season. Might be his last in Cleveland. Not the way to root. Cashman magic, Trout puts one out, the ‘D’ in D’Antoni and backwards NFL …. — The beauty of the trade that brought Gleyber Torres to the Yankees – for Aroldis Chapman, to the Cubs, a rental in 2016 – is that on Friday night Torres won the Angels game with another home run and then Chapman closed it out. That was some trade Brian Cashman made. Like, maybe as great as he might ever make. Put me down as somebody who doesn’t want to see Shohei Ohtani anywhere near the Home Run Derby. You sort of knew that a Jersey kid like Mike Trout was going to hit at least one ball out of Yankee Stadium Friday, right? The shame of Trout playing Out There and the way the schedule is set up in Major League Baseball is that unless something happens in October, these are the only three games Trout will play in New York all year. It’s like when the Garden would only get to see Magic or Kobe Bryant once a year. One of the remarkable sights – other than Quinn Cook somehow taking what felt like the biggest shot of the Warriors season at the time, forty-seconds left in Game 5 — of the NBA postseason was how panicked the defending champs of the world look with 6.7 seconds left at the very end of that game. They weren’t running a play; they were running a fire drill. — The Red Sox better be right about Hanley Ramirez. Everybody involved said that it wasn’t about the money, after the Sox DFA-ed Ramirez, a guy who had a vesting option for $22 million next season if he made 475 plate appearances this season. —For a guy (and a really good guy) like Mike D’Antoni who’s only supposed to be interested in coaching fast offense, his team sure has played some pretty fancy defense against the Golden State Warriors. —It is amazing that NFL owners have clearly continued to buy into the cockeyed notion that ratings were down last season because of anthem protests. Had nothing to do with as much mediocre football as we saw Sunday after Sunday, and across the board. Had nothing to do with big stars like Aaron Rodgers and Odell Beckham, Jr. getting hurt. Had nothing to do with a lot of Sundays when if Brady and the Patriots weren’t playing you wondered who you really, really wanted to watch. It was the handful of guys the president of the United States called “SOBs” doing this kind of damage to that shield Roger Goodell is always saying he has to preserve and protect. I keep waiting for these same owners to blame all of this on Hillary Clinton, too. Goodell and his owners took a bad situation and made it much, much worse. The NBA has its own policy, and it says that its players have to stand for the anthem. But the NBA’s policy was collectively bargained for. It doesn’t work that way in pro football, which got way more blowback – and properly so – than it ever bargained for this week. — Every once in a while when Rudy Giuliani is on television I expect him to stop and ask what happened to the mariachi band.